﻿ Fun Easy English - new classroom free online classes english language lessons speaking listening writing reading october 11. Today in the Fun Easy English classroom you are going to learn "typa" an American English reduction. What typa food did they serve? What type of food did they serve? What typa food do you want to eat tonight? She found this new typa hand cream at the store. He found a new typa bug in the yard. What typa girls do you like? What typa things do you want to see in this city? Hey remember typa is not a real word in English. Typa is simply the way Americans often pronounce the word type of. 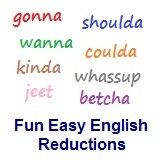 Reductions, such as typa are not real words in English.